comes with a beautiful bright and rich palette. I had fun with the Tim Holtz Stain / Rusty Hinge . it flows on so smoothly . Time in the garden is food for my soul. For years the rose has been cultivated for its exquisite perfumed oil. Roses dance in the warm summer sun filling the air with an intoxicating fragrance. The rose looks great in any vase or pot, in all situations, It complements all food and table settings. there are a million little things I love about our home . I have a perfect spot for displaying my collection of potted beauties. hope you have a play with this case it is a fun palette. big hugz to you all. HI.. I have just been over to CSI and am blown away by the wonderful layouts the girls do... and this is so beautiful.. I love roses too, and have a few in pots, after the drought was way to harsh to keep them in the ground.. 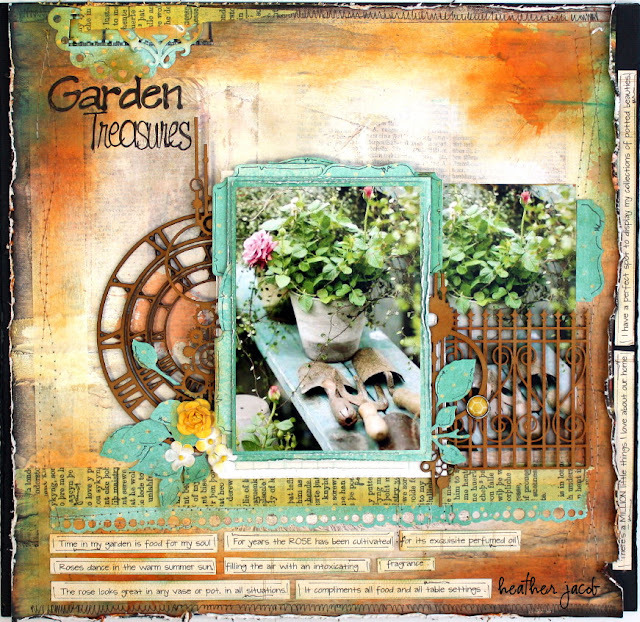 I love the fence and i agree with your journalling too..
Oh wow, really love this lay-out! 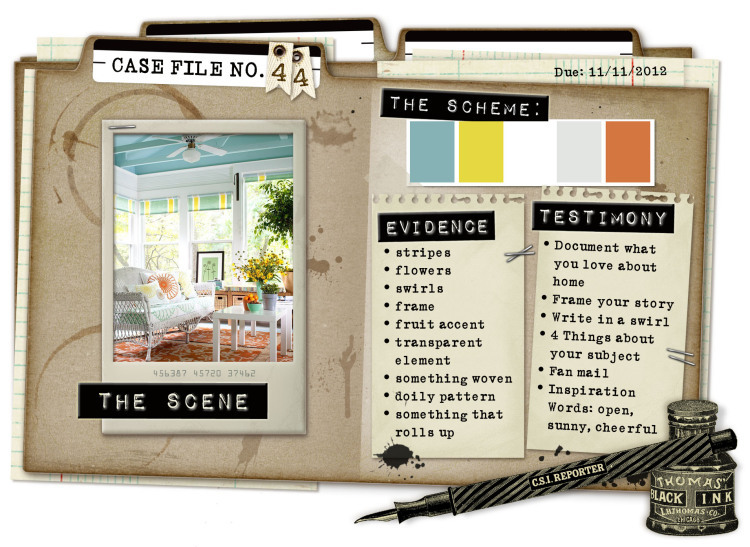 Gorgeous colours, beautiful details and great journaling. LOVELY...haven't got into the swing over at CSI since coming home...yet...the way you've 'matted' your main photo is really, really great....love the newspaper in there, too...just bought 4 new Distress ink pads....better get onto a few more LOs so I can justify buying them, eh???!!!!! Gorgeous! Another awesome art work, I'm speechless. Color combination and all elements fit perfectly together. Thanks for visiting ma blog and lovely comment.I'm your follower now. Great colorcombo you made a amazing page with it! Wowwwwwwwwwwwwwwwww! This is GORGEOUS!! I loveeeeeeeeeeee the colors and loving the wood accents!!! This is just gorgeous! Love everything about it as well as the pics! Totally beautiful - love the chipboard clock and fence. Awesome job with the case file! This is just divine Heather! I adore how you used the colour palette. This is gorgeous I love the way you journaled!!! This is absolutely fantastic, Heather!! The colors are so beautiful!! Coming over for a visit makes me slow down the crazy pace I'm living in at the moment. Eating my lunch and just soaking in all this splendor makes me so so happy and content. You really do have a special way with anything garden related! This page is SO beautiful, wonderful with the garden fence and your darling doodling! Mwah! Love love love Heather. The colours, your blending, the photos.....it all takes me into your magical garden. Amazing layout Heather! I love the Rust Hinge stain on it, it's just a great color. The pictures are amazing well really the whole things is amazing. This one belongs in a magazine. Loving the rust look - this is fantastic! Gorgeous work - totally fab!!!! love love those pops of teal, just divine!